Remote control cars and trucks have always been a childhood favorite for generations of kids. 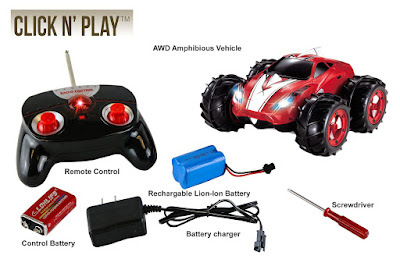 With this remote control RC car your child will have hours of fun pulling off stunts and stimulating there imagination as they pretend to be in the drivers seat. Remote control vehicles are also educational as well, they can encourage learning in areas of technology and electronics. Being an amphibious RC car your child will love to play with this toy no matter the weather. Also fun for parents too! Multi direction and does 360 degree spins to pull off cool tricks to impress your friends. Features realistic working headlights and a high capacity battery for up to 1 hour of fun. 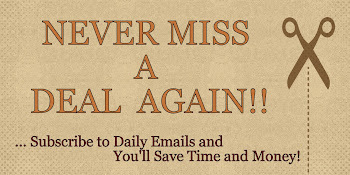 Made of super high quality material, made to last. Includes: Amphibious remote control car, Transmitter (9v bettery included) , Rechargeable battery, Battery Charger, Screwdriver. When I was a kid, I loved RC cars. They're a lot of fun for boys and girls. 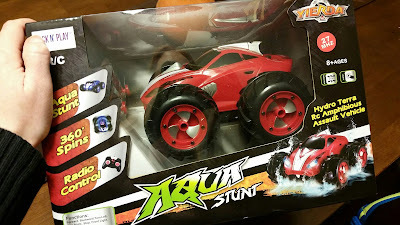 I really like this particular RC car because it can be used on land and/or on water... How cool is that?! It's been raining a lot and my boys really got a kick out of driving this car through the puddles. We drove it around for a good hour or so and it seemed to hold up really well on land and through the water. I also loved that this car came with a battery and it's rechargable. We got the red car and the design is cool and sporty looking. Very good size and nice quality. Overall, my kids really like it. We've only had it a few days and use it a few times, and so far so good. This is definitely something that will keep my boys busy. I'm really hoping it will last awhile. 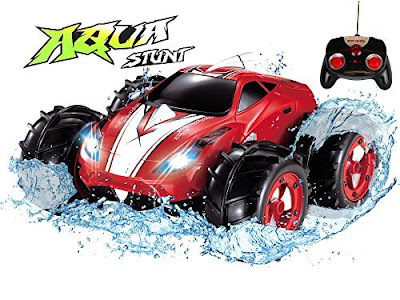 If you would like to grab Click n' Play Land & Water Amphibious RC Remote Control Car for yourself, you can purchase it right now from Amazon!